I really wanted a white slipcovered sofa and Pottery Barn was out of our price range so I kept searching for alternatives. 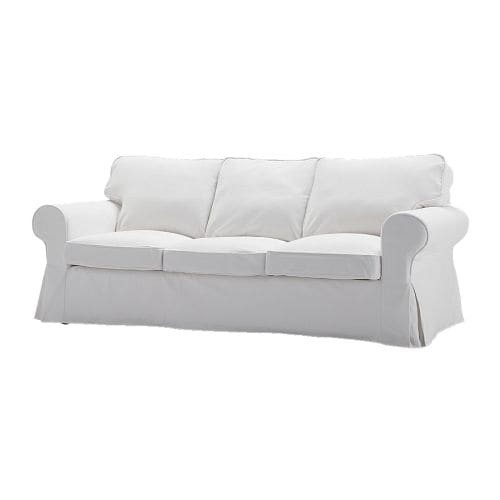 Locally, I found one at Rooms to Go for $900 but when I found Ikea’s Ektorp sofa, I knew I had to figure out a way to get one! Buying it online was too expensive due to Ikea’s shipping. I think it was like $330 for shipping alone which was almost the same price as the sofa! Apartment Therapy had a great post on where to shop for Ikea when you don’t have one close to you. To see that post, click here. They mentioned a Blue Bag in Kansas City but a reader commented about one in New Orleans. Since that is closer to me than the Houston store, I checked out their website. The process was very easy! I went online to Ikea’s website and put the sofa on a wishlist. I then emailed the wishlist to Blue Bag. They sent me an invoice which included the price of the sofa, tax and their shipping price. I paid the invoice on Monday and by Thursday, I had an email stating that my order was ready for pick up! Their shipping was $100 versus Ikea’s $330! I am very satisfied with my purchase! It’s comfortable and the size is perfect for the narrow sunroom. If it holds up good, I’m thinking about purchasing the matching chair. To read more about the assembly, click here. I wish we had Blue bag here in Southern Illinois, I would go crazy shopping with Ikea stuff!